Sessions are held every other week over a period of 8 weeks. The Overcome Anxiety Clinic™ is a natural and holistic approach to managing and overcoming anxiety and stress. It is designed for those who suffer from, for example, stress, generalized anxiety disorder, panic disorder, and post-traumatic stress disorder. 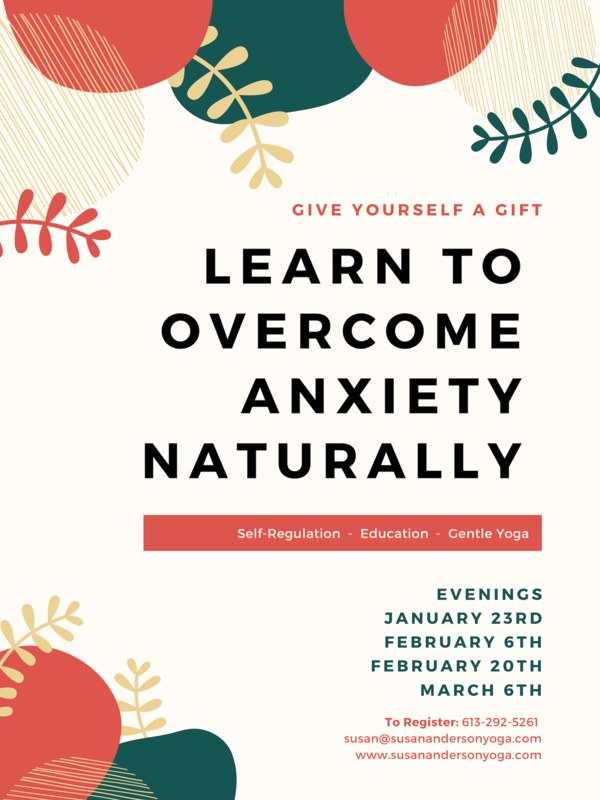 Each session in this four-part series includes education, gentle yoga (no yoga experience required), an exploration of mindfulness, meditation, mudras, affirmations, guided relaxation and many other self-regulation tools and techniques to break the psychological, biochemical and physical cycles of anxiety. The dates and times for the sessions are 7:00 pm – 9:30 pm, January 23rd, February 6th, February 20t,h and March 6th. Sessions will be held at Kneaded Touch Massage Therapy, 4100 Strandherd Drive, Suite 206. The clinic will be led by Susan Anderson, therapeutic yoga teacher (RYT-500), and trauma-informed yoga teacher. For more information go to www.susanandersonyoga.com.